I will remember 2017 more for political and financial reasons than wine. Trump. Kim Jong-un. Mugabe. Zuma. Gupta. Bitcoin. Steinhoff. It seems that every week there was some new scandal grabbing the headlines. All this, plus the severe drought in the Western Cape could make one view 2017 as quite a bad year overall! The South African wine industry though has given us a silver lining. International demand for South African wine is picking up nicely. Wine critics across the globe are writing excitedly about our wines, especially the weird and wonderful ‘new wave’ wines coming from the many young winemakers across the Cape. Even the ‘old guard’ are getting plenty of attention, such as Abrie Beeslaar / Kanonkop picking up the International Wine and Spirit Competition Winemaker of the year Trophy, following-up on Andrea Mullineux winning the Wine Enthusiast Winemaker of the year award in late 2016. The Thelema and Sutherland wines have done pretty well too, with the Sutherland Chardonnay 2015 scoring 96 points in Decanter (joint-top scoring South African chardonnay in the tasting of 111 wines), and the Thelema Rabelais 2013 being declared best wine overall in the Winemag.co.za Cape Bordeaux Red Wine Report. Although these scores and awards are always welcomed, the most important critic of our wines is the customer, and I’d like to say a huge thanks to all the Thelema and Sutherland supporters out there. We continue to work hard at growing the best fruit possible from our two properties, and maintaining that high standard of viticulture and winemaking that Gyles and Rudi have cultivated over the years. Speaking of Gyles, we celebrated his 70th birthday in early December, with over 100 of his friends and family gathering on Thelema for a celebratory lunch. Even the rain showed up, moving the party from under the trees and into one of our sheds! We’ve seen plenty of wildlife on the farm in the last few months. An adult female leopard (named Stella by the Cape Leopard Trust) has been caught on camera on numerous occasions on the Simonsberg mountainside, even venturing as far down as a poplar grove just next to our dam, about 300m from my house! 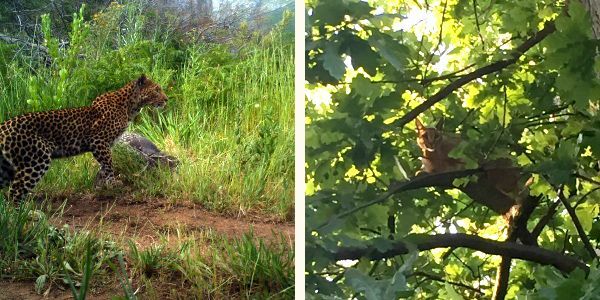 I was lucky enough to spot a Caracal in an oak tree just next to our Muscat de Frontignan vineyard in October. I am pretty sure my dog Finn was the reason it was up there, where it sat quite happily watching us walk past. Gyles also recently saw (for the first time on Thelema) a Verreaux’s eagle (also known as a black eagle). It is wonderful that we have so much wildlife on the Simonsberg. If you are in the Cape over the festive season please pop in for a tasting and a chat. Wishing you all a very happy and peaceful festive season.